As the autumn chill sets in, refugees stream into Berkasovo in northwestern Serbia, bundled up in blankets and wearing all the clothes they have with them. They wind their way through orchards and farms, getting closer and closer to the border with Croatia, the next stop on their northward journey to a country that can offer them safety, solace and refuge from the turmoil they left behind. They have had only limited access to shelter, food, water and bathing facilities on their long and arduous trek, and arrive here in Berkasovo cold, exhausted, hungry and anxious. The increasingly harsh conditions and exposure to the elements have taken their toll, and many refugees are sick. On this morning, just before the entrance to the crowded, muddy, trash-strewn transit camp where refugees must wait before being granted entrance to Croatia, an International Medical Corps-supported mobile medical team sets up a makeshift clinic. The team includes a doctor, nurse, counselor, translator and coordinator. They quickly get to work, greeting refugees in transit, offering care, providing speedy consultations and dispensing medicine. 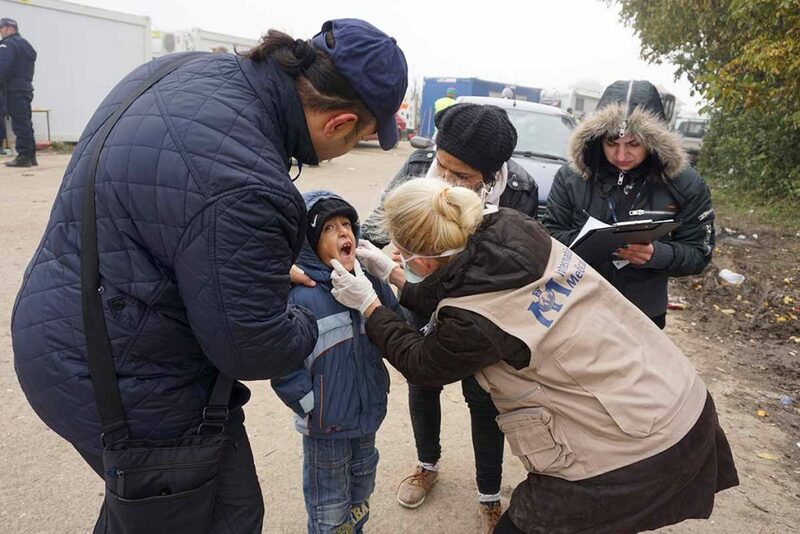 “Today, we assisted refugees with sore throats, coughs, fever, ear aches, skin rashes, diarrhea and joint pain,” says Dr. Andja Rosic. “We also see a lot of wounded, infected and swollen feet from all the walking. But the vast majority of consultations right now are for symptoms of colds and flu.” The team is bracing for many more cases of influenza, as well as hypothermia, as winter approaches. Our local partner, International Aid Network, procures medicines daily ranging from ibuprofen, antibiotics and antihistamine creams, to drugs for chronic ailments, like diabetes and high blood pressure. Many refugees with chronic conditions have used up their medications or lost them during their journeys. Tijana Eror (right below) records the name and age of every patient, their symptoms, medicines dispensed and their countries of origin. On this day, the team carries out 96 consultations. Tijana is also the team psychologist and provides counseling to refugees seeking help or showing signs of emotional distress. She says many refugees were exposed to unimaginable levels of violence and loss and continue to experience traumatic events, fear and anxiety as they flee. For parents, however, their greatest concern is the welfare of their children, and finding a better, healthier and safer place to live. 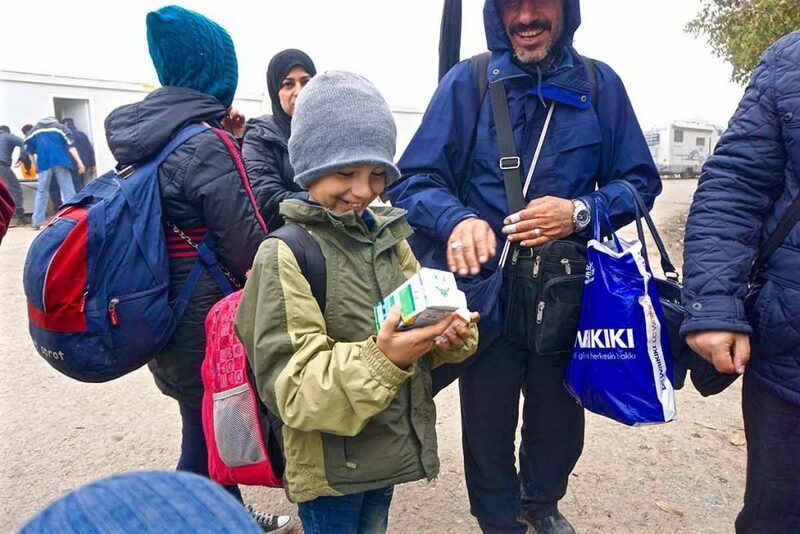 For this little Syrian boy—suffering from a nasty cold for days after being on the road with his family for months—comfort and joy come in the form of a bottle of cough syrup. His grateful dad told our mobile medical team that it was the first time in a long time that he’s seen his son so happy.